Laurel & Hardy… a comedy duo whose heyday was the 1930s and 40s. That’s over 75 years ago. To be brutally honest, not many people who would truly appreciate a movie about the final years of Laurel & Hardy are still alive to see it. That’s one of the biggest challenges facing “Stan & Ollie”. And, unfortunately, that challenge isn’t met in this only mildly entertaining biopic. 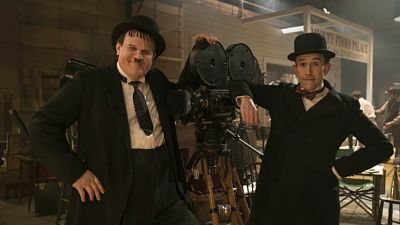 The film begins in 1937, with Stan Laurel (Steve Coogan) and Oliver Hardy (John C. Reilly) at their height as huge, bankable Hollywood stars. The pair made over 100 films together and were famous worldwide. But contract squabbles with the Hal Roach film studio would soon get Stan fired. Ollie followed out the door a short time later. The narrative then flashes forward 16 years. Laurel and Hardy are kicking-off a comeback stage tour designed to promote their new satirical Robin Hood movie. But scars caused by their previous separation (and other issues) put stress on their relationship (though there are no scenes to help make this conflict real). Can these two partners get along and achieve a career renaissance? Will the Robin Hood movie get made? Will their wives bicker even more than they do? Frankly, does anybody really care? There’s not a whole lot to latch onto in “Stan and Ollie”. The screenplay (by “Philomena”’s Jeff Pope) lacks both drama and emotion. Instead, he packs the film with Coogan and Reilly re-enacting numerous Laurel & Hardy bits. But again, unless you’re of a certain… and I mean certain… age, or you’re a comedy historian, these scenes will neither amaze or amuse. “Stan & Ollie” is a difficult film to relate to on a number of levels. Coogan and Reilly are fine actors, and there are a few scenes that allow them to go a tad deeper both comedically and dramatically. But they’re rare. Only wow-factor comes courtesy of the makeup on Reilly that allows him to look like the very rotund Hardy. Director Jon S. Baird has made a good-looking film that sincerely respects the craft of these two comic geniuses. But his overall tame approach prevents us from caring whether they get their final curtain call or not. On The Official LCJ Report Card, “Stan & Ollie” gets a C.